Anyone who knows me will know that Pho is my all time favourite food and so when I got my new pho bowls and ladles for Christmas I knew that it was going to be first of my list of new year recipes. Having also gotten a Vietnamese cookbook for Christmas I gave it skim and found there wasn’t a chicken and prawn pho recipe so I went ahead and free styled. I was aiming for my pho to taste like the amazing kind that I have had in London in places like Pho and VietEat and so I was over the moon (to be fair I was ecstatic) when my end result actually tasted like the restaurant version!! Everywhere I have been they use pre roasted chicken and it makes it so much tastier and easier if you do this too (I usually roast a chicken on a Sunday and then use it for salads and dinners throughout the week). If not you could poach your chicken breast in the stock or roast it and then shred it (this will take a bit longer). Either way this is an amazing dish. The end result it so fresh and tasty and sooooo satisfying!!! If you like ramen or any noodle dish this is one for you. Even my other half, who usually isn’t a fan if this sort of food, loved it, albeit he did refer to it is a ‘posh pot noodle’. It may seem like it is a bit fiddly and has quite a few ingredients its actually very straight forward and most of the ingredients (for the stock in particular) I have in my store cupboard anyway. First make the stock. Begin by taking a large deep pan, spray with 1kal and fry the onion, ginger and garlic until soft (around five minutes) and then add 2 litres of boiling water and the rest of the stock ingredients. Leave to simmer while you prepare the rest of the dish. In a separate pan cook the udon noodles in boiling water for 5 minutes then drain and rinse with cold water. Split between two large bowls. Top the noodles with half the roast chicken in each bowl. At this point you want to sieve your stock to get rid of the lumps. Sieve into a large bowl and then in the empty stock pan, flash fry the prawns. Add the prawns to the bowls with the chicken and the noodles and then return the stock to the pan. Add the pak choi (if using) stir and simmer for another minute to wilt (you could add spinach too). Squeeze in two quarters of the lime and stir. 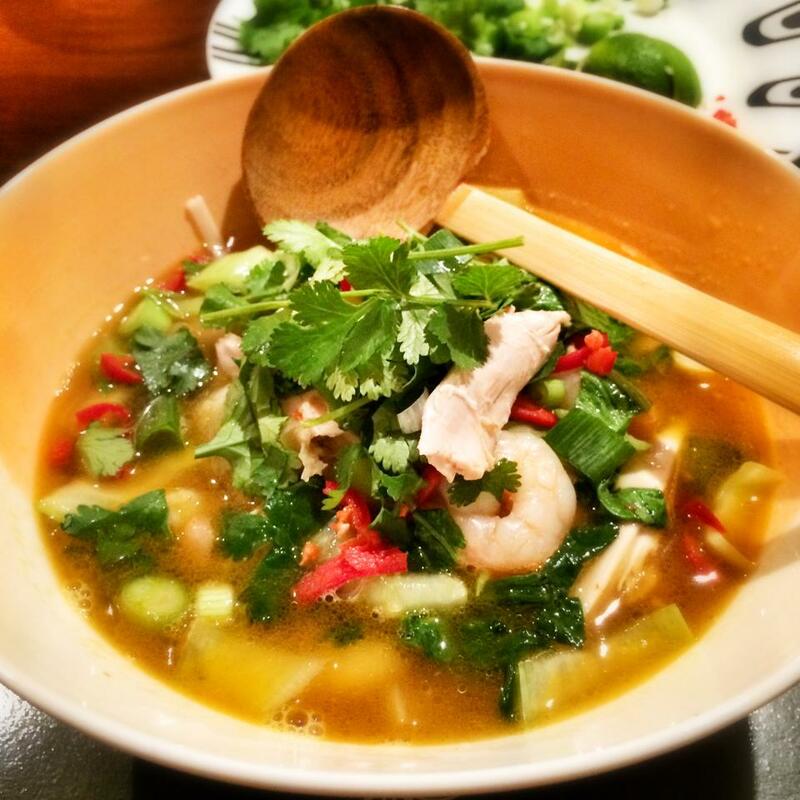 Top the noodles, chicken and prawns with a generous amount of stock. Serve at the table in the bowls with chop sticks and large spoons. Pop the garnishes in the middle. The idea is that you keep adding the garnishes as you eat so the flavours stay nice and fresh. These are really important and add amazing flavours to the dish.